What It Is: As I’ve mentioned before, I grew up in Winnipeg, which is known to outsiders for two things: cold winters and mosquito-ridden summers. However it’s problems like those that have led to awesome innovations like today’s featured brand, Aromaflage. In a nutshell? This spicy, woodsy-smelling perfume and candle collection repels mosquitoes, toxin-free, using a proprietary blend of EPA-approved essential oils. Awesome smell aside – because we’ve all winced at that pungent tang of regular mosquito sprays – Aromaflage products are toxin-free, meaning no DEET, Parabens, and Sodium Lauryl Sulphate. Of course you’re probably wondering how effective a product that smells so good and is free from harsh chemicals can really be. The short answer is – very. Aromaflage has been tested against DEET-loaded formulas and performed just as well. The only minor hitch is it needs to be applied more often (every 2.5 hours), but otherwise it functions just as well as any other commercial brand. Aromaflage is available in three handy products – a Purser spray, which has about 70 sprays (they recommend 6 sprays for a serious nature excursion, whereas a spritz or two should be enough to protect you for say, a backyard BBQ) for $30. A 50 ml flagship bottle, which has a whopping 700 sprays and is perfect for family camping trips. And a candle, so you can kick those funky-smelling citronella ones to the curb. 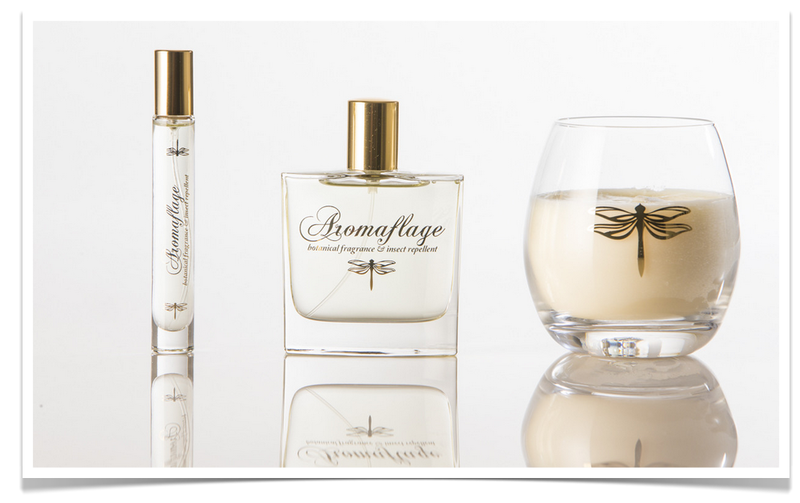 Aromaflage is in the midst of launching a brand new scent called Aromaflage Wild, which offers the same bug-fighting prowess of their original scent, but with a unique new aroma for those looking to switch things up. Want to learn more about this fantastic brand? Aromaflage will be on the Marilyn Denis Show on Friday, June 26 so you can watch it in action. Who It’s For: Obviously Aromaflage is perfect for anyone that loves to get into the great outdoors – but even parents who are worried about chemicals and bugs alike will love it so they can safely protect their child while at the park. What It Costs: Aromaflage’s products range from $30-$65 USD, although they also offer samples for $3.50, tons of gift sets, and some unique products like a 9-wick party candle. In Canada I spotted their products from $34 for the Purser. Where It’s At: Aromaflage can be bought online, and it’s also available from a range of select Canadian retailers, including Muskoka Living, White Oaks Resort, and Petal & Post. 1) There’s three steps you’ve got to take to enter this giveaway. First, you must be a Canadian Gift Guide subscriber to enter this giveaway. Just find the ‘Gift of Gab’ box on the righthand side of this page and either hit ‘Follow’ or enter your email address. Secondly, leave a comment below telling me what you think of this awesome summer gift idea. Finally, visit Aromaflage’s Facebook Page or Instagram Feed. Like / Follow them. 2) Entries are limited to one per person / per email address / per household (or more if you score bonus entries). A random draw will be conducted on or around July 11, 2015 to select the winner(s), who will have 48 hours to respond before another winner is chosen in their place. 4) BONUS ENTRY: You’ll notice on both of Aromaflage’s accounts they’ve posted a promo specifically for Canadian Gift Guide readers. Share that post onto your own Facebook / Instagram feed, use the tags #winwild #bewild, and link to it in a separate comment below. Once you’ve done that, you’ll have earned an extra entry into the draw! What a great idea! Love it … I hate getting mosquito bites and this would be a great help to prevent them! These products look wonderful. Could have used them this morning against the Northern black flies and mosquitos! I subscribe by email. I love woodsy big time. So yes, I would love to have this in my home. Going to check it out actually. Thanks for the review. I’m not convinced it would actually work, but I would be willing to give it a try! I’ll try anything to stop mosquitos and black flies – we live in a wooded area and they are vicious,. I think this is a great idea. I would love that 9 wick party candle out on the patio! I left a message on the Aromaflage Facebook page saying that I saw them featured on this site. I love this idea for a gift but I would love to have this for myself as well. I am always worried about putting mosquito sprays on my kids so I would love to try this. Awesome giveaway! I would love to try this product especially for my grandchildren. It would be perfect for the farm or lake – thank you! As someone whom mosquitoes love to feast on, I think this would be wonderful to use. I’d love something that keeps the mosquitoes at bay and has a nice pleasant scent. I think this is a fantastic idea – great function, and great scent (at least by the sounds of it)! I’m 100% in favor of natural products to deter mosquitos etc. I would like this product very much. So glad to hear about the ingredients in Aromaflage. I will check it out on Marilyn today. The packaging is very beautiful. I think it’s a good idea, practical and Toxin Free. I like Aromaflage on facebook as Nicole Graham. Shared their post on facebook. This is great and we are always on the patio and would use this. This would be great for my mom. She gets the worst mosquito bites – they turn into huge welts! I work long days landscaping outside in the summer time. I smell like bug spray stuck with dirt stuck with herbicide stuck with dead ants and skeeter scabs all season long. Maybe if I cloak myself with Aromaflage I can sweet smell the bugs away. If this works it would be a fabulous idea. This is a great summer idea! I want to be free from bugs without the harsh chemicals. I would love to use a product that repels mosquitos but smells great! I can’t wait to try this! My bites turn into welts, so I don’t go outside as much as I’d like to. I love mosquito repellants without DEET. I need this! I am a mosquito magnet! Sounds great – I lived in Winnipeg too so I know what the bugs can be like! I think this product is awesome! it’s hard to find effective toxin-free products! How unique and looks like a high quality products. Like the idea that Aromaflage products are toxin-free. I could really use this during the summer. I get so many mosquito bites. I subscribe to your blog and I liked their page on facebook. I don’t know that I would deam the product “gift” appropriate, but I would deffinitely love to try the products and see how well they work. Bugs are inevitable, but it’s nice to be able to cut down their numbers at get togethers and bbq’s. I’ve not found anything that worked very well yet so i’m excited for this! This could really change the smell of camping. I’m all for that! would love to try something that didn’t stink the high heavens! I think these are great. There are so many mosquitos around here. I love these products — they would be great to have when camping. This product sounds like a great summer gift idea, we spend a great deal of time outdoors and this would really help. This is an awesome gift idea. We’re all rabid blueberry pickers in my family. And the bug spray we need to use usually works well, but smells awful. So this would be super popular. I’ve liked Aromaflage on Facebook. What a wonderful and beautiful idea. Love it. New subscriber here. I also follow on FB with the same name. Thanks! Heard about you from Dr. Joey Shulman. Looks fantastic with the beautiful logo and packaging. I would love to try since I get eaten alive and am looking for a natural product that works! Id love to have this. it looks really good!